specific single. The CD will be part of radio station giveaways associated with the screening of the film, and Lands will likely do showcase gigs in L.A. and New York, possibly touring if sales are strong enough. Lands, from Montreal, had a hit in Canada with "Can't Hold On," and over the last couple of years has landed tunes in TV shows ("Felicity," "Family Law") despite not having a domestic deal. Songs on the album were wholly revamped lyrically but unchanged musically. "I Wish You'd Ask to Dance With Me" was a hit in 1936 as "I Didn't Expect Your Tears"; "Fall in Love Again" was written in the Warsaw ghetto in 1940 as "Wherever You Are, Come Back"; and "My Memories of You" began life in 1948 as "Silent Night." Boosey & Hawkes will publish a songbook associated with the album, and a documentary on the pianist's life is being readied for U.S. television in 2004. "In just a few months," Szpilman says of the retelling of his father's story, "we'll cover an entire life that he never talked about." In ``The Pianist,'' director Roman Polanski's harrowing, heart-rending and altogether extraordinary movie, actor Adrien Brody portrays Szpilman and re-enacts the unlikely story of his life in and around the Warsaw ghetto during World War II. We see Szpilman transformed from an urbane classical pianist to a desperate survivor who repeatedly escapes death while his family and more than 3 million other Polish Jews are systematically murdered by the invading German forces. ``The Pianist'' is accurate as far as it goes. But, like the book by Szpilman on which the movie is based, it leaves out part of Szpilman's musical story. While Szpilman (pronounced SHPIL-man) was a respected classical pianist, he was even more highly regarded as a pop songwriter. Now, on the heels of the successful all-classical soundtrack to ``The Pianist,'' a new CD titled ``Wendy Lands Sings the Music of the Pianist Wladyslaw Szpilman'' reveals the light and lively side of Szpilman. ``My father was not known as a pianist in Poland,'' Szpilman's son Andrzej says from Italy, where he has traveled from his home in Germany to speak at a showing of ``The Pianist.'' ``He was known only as a composer of popular songs. Not a polka in the batch either. Szpilman's songs sound far more American than Polish. 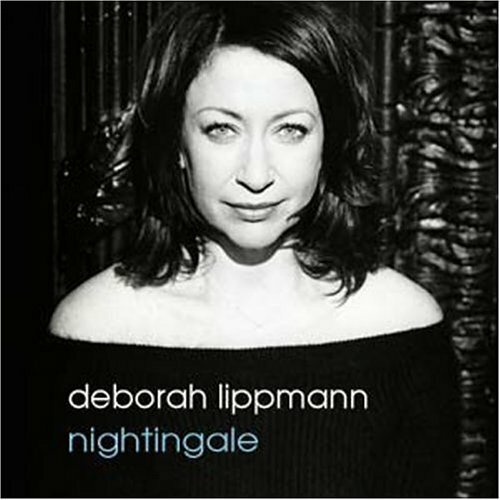 On the CD by Lands, a Canadian singer/songwriter little known in the United States, Szpilman's music goes in the contemporary direction of a Norah Jones or Sarah McLachlan. Lands' CD is part of Andrzej's ongoing effort on behalf of his father, a man who was more concerned with artistry than self-aggrandizement. Immediately after the end of World War II, the elder Szpilman returned to his job as a pianist at Polish Radio and wrote a startling account of his wartime survival titled ``Death of a City.'' It disappeared shortly after its publication in 1946. Andrzej, born in 1956, did not know of the book's existence until he discovered a copy in his father's bookcase at age 12. Five years ago, he succeeded in getting it republished as ``The Pianist'' in Germany. Szpilman died at 88 in 2000 before his book was made into a movie by one extremely interested reader, Polanski, a Polish Jewish Holocaust survivor himself. Certain that Polanski's movie would create new interest in Szpilman's compositions, which include classical works, movie scores and children's music, last year Andrzej began work on a CD that would showcase Szpilman's pop talents. ``I felt I owed it to him to present his music to an American audience,'' he says. ``First we found American writers to write new lyrics, because the original lyrics, some by great Polish poets, were very local, very Polish. Then we auditioned singers and found Wendy Lands. On ``Wendy Lands Sings . . .,'' Szpilman's melodically and rhythmically rich music is turned into thoroughly modern pop songs. Lyricists such as David Batteau and Michael Ruff provide the romantic words. Studio stalwarts such as guitarists Greg Leisz and Heitor Pereira play uncluttered arrangements by producer John Leftwich, best known for his years as Rickie Lee Jones' bassist. But what would Szpilman think of this transformation of his songs into up-to-date American pop? "Wendy Lands sings the songs composed by Wladyslaw Szpilman"
Valentines Day turned out to be Valentines week here on the Hollywood Beat, starting with a ladies only dinner at Pammolli Ristorante in Beverly Hills, hosted by Academy Award nominated songwriter Carol Connors. The theme was Men come and go  but girlfriends are forever; and among the participants were Rhonda Shear (former host of USA Networks Up All Night); Charlene Tilton (best known as Lucy Ewing in the award-winning Dallas); famed classical guitarist Leona Boyd, hotelier (Four Seasons) Beverly Cohen and fellow columnist Anita Talbert. Among the most interesting news we picked up at this dinner was that Connors has been blessed to write the lyrics for Wladyslaw Szpilmans songbook. He is the composer/pianist from Poland, about whom the Academy award nominated film The Pianist is based. 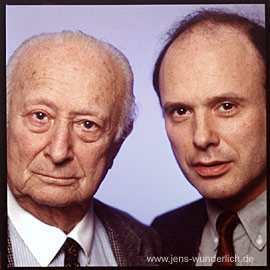 His son, Andrzej, pictured here with Connors, has commissioned her to write four songs, with the stipulation that not one word of his fathers music can be changed. A real challenge for her, but illustrates he is very much the custodian of his dads legacy. 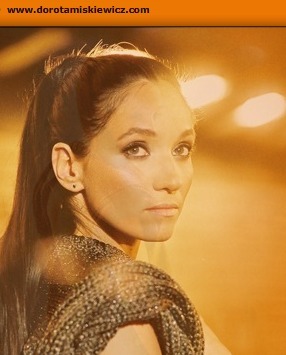 Montreal-born singer Wendy Lands was selected to voice the updated melodies in the The Pianist. TORONTO -- When the Jewish pianist Wladyslaw Szpilman was writing an autobiography about narrowly surviving the Holocaust and then becoming one of Poland's most famous composers, it's unlikely he ever imagined his words being transformed into a big screen biopic by acclaimed director Roman Polanski. But what about his music being turned into contemporary ballads sung by a pop singer? That's what his son, Andrzej Szpilman, has done in the hopes of teaching young North Americans about his late father's music while the man's extraordinary life is being shown in theatres. A Holocaust drama, The Pianist tells the story of Szpilman (played by Adrien Brody), who escapes from a boarding line for the train taking people to the Treblinka death camp only to go into hiding in Warsaw's ghetto during the Second World War. He goes unnoticed with the help of non-Jewish friends and a German officer. The Pianist won the prestigious Palm d'Or at Cannes and received two Golden Globe nominations last week. "The film depicts such a brutal situation for this man but the truth is that he rose above it," says Wendy Lands, the Montreal-born singer selected to voice the updated melodies. "He even wrote some of these songs during that time -- that blows my mind. "The songs are actually uplifting and they're not dark and they're not heavy. It was really imperative that come through (on the disk)." Lands -- who was once in the failed 1986 pop duo Double Dare with Andy MacLean -- says she automatically "clicked" with the spirit of the late Szpilman, whom she describes as the Gershwin-McCartney of Poland. After the war, Szpilman returned to his old job at Polish radio and became a famous composer. His memoirs were published around the world. He died two years ago at 88. "I really got to know this man through his melodies. That's a pretty intimate way to get to know someone," Lands explains over the phone from Los Angeles, where she moved two years ago. Her Jewish upbringing didn't hurt either, she adds. 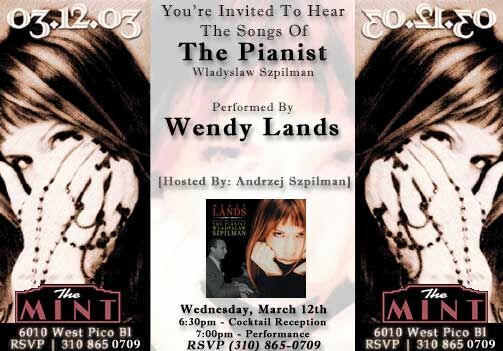 The CD, entitled Wendy Lands Sings The Music Of The Pianist Wladyslaw Szpilman, features a dozen songs from the composer's catalogue of about 500 songs. Land's sultry jazz-infused vocals are laid overtop of smooth pop melodies played on electric guitar, drums and bass as well as the more traditional violin, cello and piano. "It was important that there not be anything melancholy or tragic sonically about this project," says Lands, who was urged not to see the film or read Szpilman's memoirs until the recording was completed. "(Andrzej Szpilman) wanted it to be very fresh and very North American ... He wants his father to be as popular as he once was, and as popular in North America as he was in Poland." Lyrics were written by several songwriters including Michael Ruff (Bonnie Raitt's Cry On My Shoulder, Huey Lewis's That's Not Me). Lands and her producer husband Jim Gillard, whom she met while recording her 1996 solo album Angels & Ordinary Men, also penned a song. It was produced and arranged by John Leftwich, who has recorded and performed with Lyle Lovett, Sergio Mendes, The Chieftains, Tori Amos, Dizzy Gillespie, Ricky Lee Jones, Nancy Wilson and Los Lobos. This is one of Europe's oldest music festivals. The unique scenery of the Forest Opera gathers representatives of a wide variety of song and music styles and genres. The festival's name changed several times over the years, as did its formula and organizers. The idea originally came from Wladyslaw Szpilman, an outstanding pianist, music director of Polish Radio, and a versatile composer who wrote both classical music and popular songs. The first three editions were held in the Gdansk Shipyard hall (1961-1963), after which the festival moved to the Forest Opera (Opera Lesna) and quickly became the greatest event, together with the OPOLE FESTIVAL, at which young talents could present themselves, competing for the main prize - the Amber Nightingale. The SOPOT FESTIVAL is also an opportunity to listen to international stars. In the past, the festival has featured Charles Aznavour, Boney M, Johnny Cash, and more recently: Chuck Berry, Vanessa Mae, Annie Lennox, Vaya Con Dios, Chris Rea, Tanita Tikaram and Whitney Houston. Goran Bregovic was the star of last year's festival.